"Mrs. Vandebilt (Continental Europe and Austraila only)"
"Band on the Run" is the third studio album by Paul McCartney and Wings, released in December 1973. It marked the fifth album by Paul McCartney since his departure from the Beatles in April 1970. Although sales were modest initially, its commercial performance was aided by two hit singles – "Jet" and "Band on the Run" – such that it became the top-selling studio album of 1974 in the United Kingdom and Australia, in addition to revitalising McCartney's critical standing. It remains McCartney's most successful album and the most celebrated of his post-Beatles works. The majority of "Band on the Run" was recorded at EMI's studio in Lagos, Nigeria, as McCartney wanted to make an album in an exotic locale. Shortly before departing for Lagos, however, drummer Denny Seiwell and guitarist Henry McCullough left the group; with no time to recruit replacements, McCartney went into the studio with just his wife Linda and Denny Laine, doubling on drums, percussion and most of the lead guitar parts himself as well as bass. On arriving, it was discovered that the studio was below standard, and conditions in Nigeria were tense and difficult; the McCartneys were robbed at knife-point, during which a bag containing unfinished song lyrics and demo tapes was taken. After the band's return to England, final overdubs and further recording were carried out at AIR Studios in London. In 2000, Q magazine placed it at number 75 in its list of the "100 Greatest British Albums Ever". In 2012, Band on the Run was voted 418th on Rolling Stone's revised list of "The 500 Greatest Albums of All Time". A contemporary review by Jon Landau in Rolling Stone described the album as "with the possible exception of John Lennon's "Plastic Ono Band", the finest record yet released by any of the four musicians who were once called the Beatles". It was McCartney's last album issued on the Apple label. Paul thought, I've got to do it, either I give up and cut my throat or [I] get my magic back. Bored with recording in the United Kingdom, McCartney asked EMI to send him a listing of all their international recording studios, McCartney selected Lagos in Nigeria and was taken with the idea of recording in Africa. In August the band, consisting of McCartney and his wife Linda, ex-Moody Blues guitarist and pianist Denny Laine, Henry McCullough on lead guitar, and Denny Seiwell on drums, started rehearsals in McCartney's Scottish home for a new album. During one session, McCullough and McCartney argued, and McCullough quit. Seiwell left a week later, the night before the band flew out to Nigeria. This left just the core of the band – Paul, Linda and Denny Laine – to record in Lagos, assisted by former Beatles engineer Geoff Emerick. McCartney had chosen Lagos, as he felt it would be a glamorous location where he and the band could sun on the beach during the day and record at night; the reality, however, was that after the end of a cival war in 1970 Nigeria was run by a millitary government, with corruption and disease commonplace. The band and their entourage arrived in Lagos on 9 August 1973. EMI's studio, located on Wharf Road in the suburb of Apapa, was ramshackle and under-equipped. The control desk was faulty and there was only one tape machine, a Studer 8-track. The band rented houses near the airport in lkeja, an hour away from the studio. Paul, Linda and their three children stayed in one, while Laine, his wife JoJo, Emerick, and Wings' two roadies stayed in another. The group established a routine of recording during the week and playing tourist on the weekends. Paul temporarily joined a local country club, where he would spend most mornings. The band would be driven to the studio in the early afternoon where recording would last into the late evening and sometimes early morning. To make up for the departed band members, Paul would play drums and lead guitar parts with Denny playing rhythm guitar and Linda adding keyboards. The first track they recorded at Apapa was "Mamunia", the title for which McCartney appropriated from the name of a hotel in Marrakesh where Wings had stayed in April 1973. It's a collection of songs and the basic idea about the band on the run is a kind of prison escape. At the beginning of the album, the guy is stuck inside four walls and breaks out. There is a thread, but not a concept. Several of the songs on Band on the Run reflect themes of escape and freedom, while the structure of the album recalled the Beatles' "Sgt Pepper's Lonely Hearts Club Band" and Abbey Road. 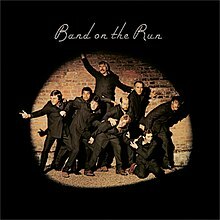 The song "Band on the Run" was partly inspired by a remark George Harrison had made during one of the many business meetings the Beatles attended in 1969, in an effort to address the problems afflicting their Apple Corps enterprise. Four years later, the album's creation coincided with what author Peter Doggett terms McCartney's "moral victory in the debate over Allen Klein", as Harrison, John Lennon and Ringo Starr now became embroiled in litigation against Klein – the business manager they had appointed to run Apple in 1969, despite strong opposition from McCartney. Doggett suggests that McCartney was perhaps liberated creatively by this recent development, resulting in "Band on the Run" bearing "a frothy self-confidence that was reminiscent of the Beatles at their most productive". Aside from the challenges presented by the primitive studio, various incidents plagued Wings' Lagos stay. While out walking one night against advice, Paul and Linda were robbed at knifepoint. The assailants made away with all of their valuables and even stole a bag containing a notebook full of handwritten lyrics and songs, and cassettes containing demos for songs to be recorded. On another occasion, Paul was laying down a vocal track when he began gasping for air. According to Emerick: "Within seconds, [Paul] turned as white as a sheet, explaining to us in a croaking voice that he couldn't catch his breath. We decided to take him outside for some fresh air ... [but] once he was exposed to the blazing heat he felt even worse and began keeling over, finally fainting dead away at our feet. Linda began screaming hysterically; she was convinced that he was having a heart attack ... The official diagnosis was that he had suffered a bronchial spasm brought on by too much smoking." Another incident was the confrontation with local Afrobeat star and political activist Fela Kuti, who publicly accused the band of being in Africa to exploit and steal African music after their visit to his club. Kuti even went to the studio to confront McCartney, who played their songs for him proving that they contained no local influence whatsoever. Later on, drummer and former Cream member Ginger Baker invited Wings to record their entire album at his place, ARC Studio in Ikeja. Though not wanting the invitation, Paul agreed to go there for one day. The song "Picasso's Last Words (Sing to Me)" was recorded at ARC, with Baker contributing a percussive tin of gravel. [Paul and I] made the album as though we weren't in a band, as though we were just two producers/musicians. Recording for the majority of the album's basic tracks, together with initial overdubbing, was completed after six weeks in Nigeria. After hosting a beach barbecue to celebrate the end of recording, Wings flew back to England on 23 September 1973 where they were met by fans and journalists. In October, two weeks after the band's return to London, work began at George Martin's AIR Studios on transferring many of the eight-track recordings to sixteen-track. The song "Jet", written about one of the McCartneys' Labrador puppies, was recorded in its entirety at AIR. Paul, Laine and Linda carried out further overdubs on the Lagos recordings during this period; all the orchestral arrangements for the album were taped at AIR in a single day, overseen by producer Tony Visconti. Another contributor was saxophonist Howie Casey, who overdubbed solos on "Bluebird" and "Mrs. Vandebilt", and would go on to become Wings' regular horn player. Final mixing on the album was completed over three days at London's Kingsway Studios in early November. "Helen Wheels" was released as a non-album single in late October, and would go on to become a top 10 hit in America the following January. For commercial reasons, Capitol Records, the US distributor for Apple Records, asked to include "Helen Wheels" on the album. McCartney agreed although it was never his intention to include the track. While "Helen Wheels" is not included on UK versions of the Band on the Run CD (except as a bonus cut on the 1993 "The Paul McCartney Collection" edition of the CD), it has always appeared on US editions of the CD starting with the initial Columbia Records release in 1984. Early versions of the Capitol release fail to mention "Helen Wheels" on the label or the CD insert, making the song a "hidden track". The album cover photograph was taken at Osterly Park, west London, on 28 October 1973 by photographer Clive Arrowsmith. It depicts Paul, Linda and Denny plus six other well-known people dressed as convicts caught in the spotlight of a prison searchlight. They are Michael Parkinson, chat-show host and journalist; Kenny Lynch, actor, comedian and singer; James Cobern, actor; Clement Freoid, columnist, gourmet and raconteur; Christopher Lee, actor; and John Conteh, a boxer who later became World Light Heavyweight Champion. Apple Records issued Band on the Run on 5 December 1973 in America (as Apple SO 3415), with the UK release following two days later (as Apple PAS 10007). Rather than the band promote the album on radio and television or with a tour, McCartney undertook a series of magazine interviews, most notably with Paul Gambaccini for Rolling Stone. The conversations with Gambaccini took place at various locations from September 1973 onwards and combined to form, in the words of authors Chip Madinger and Mark Easter, "a remarkably forthcoming interview in comparison to the 'thumbs-aloft' profiles usually allowed by [McCartney]". On release, "Band on the Run" received mostly favourable reviews. Author Robert Rodriguez writes that, after the disappointment of McCartney's previous work since the Beatles, "It was exactly the record fans and critics had long hoped he would make …"
In a combined review for Starr's concurrently released Ringo album, Charles Charr Murray of the NME wrote: "The ex-Beatle least likely to re-establish his credibility and lead the field has pulled it off with a positive master-stroke of an album entitled Band On The Run." In addition to praising McCartney for using synthesizer "like an instrument, and not like an electric whoopee cushion", Shaar Murray concluded: "Band On The Run is a great album. If anybody ever puts down McCartney in your presence, bust him in the snoot and play him this. He will thank you for it afterwards." Writing in The New York Times, Loraine Alterman considered the album to be "bursting with a great deal of compelling music even if the lyrics at times make as much sense as that cover photo" and admired the "fascinating range of sounds" offered in the title track, as well as the "lovely, romantic aura" of "Bluebird". While noting the importance of studio production on the overall effect, Alterman wrote: "McCartney has managed to make the complexities of multi-track recording sound as natural and fresh as tomorrow." Jon Landau of Rolling Stone described the album as "with the possible exception of John Lennon's Plastic Ono Band, the finest record yet released by any of the four musicians who were once called the Beatles". Rolling Stone chose "Band on the Run" as its Album of the Year for 1974. In early 1975, Paul McCartney and Wings won the Grammy award for "Best Pop Vocal Performance By a Duo, Group or Chorus" for "Band on the Run". The commercial reception was unspectacular initially, with the record-buying public wary after Wings' preceding releases. On the UK Albums Chart, Band on the Run climbed to number 9 on 22 December, remaining there for a second week before dropping to number 13. On America's Billboard Pop Albums Chart chart, it peaked at number 7 on 2 February 1974 and then spent the next six weeks in the lower reaches of the top ten. The album went on to achieve considerable success, however, thanks to the popularity of the two singles culled from it – "Jet" and the title track. Writing in 1981, Bob Woffinden described "Band on the Run" as the first Beatles-related release to be "planned with a marketing strategy", as Capitol Records now assumed a fully active role in promoting the album following the removal of Klein's ABKCO Industries as managers of Apple. Although McCartney had been reluctant to issue album tracks as singles, the public's apparent disinterest in Band on the Run led to him ceding to the recommendations of Capitol's head of marketing, Al Coury, who had similarly pushed for the inclusion of "Helen Wheels". McCartney therefore authorised single edits for the two new A-sides. "Jet" was issued on 28 January in America, with "Mamunia" as the B-side for the single's initial pressings, although this was soon replaced by "Let Me Roll It", which was the B-side for the UK release, on 15 February. The single's success provided new impetus for the album, which hit number 2 in the UK at the end of March and topped Billboard‍ '​s listings on 13 April. Apple issued "Band on the Run" on 8 April in America, backed by "Nineteen Hundred and Eighty-Five"; the UK release followed on 28 June, with the non-album instrumental "Zoo Gang" as the B-side. Due to the popularity of "Band on the Run", the album returned to number 1 on Billboard on 8 June, when the single simultaneously topped the Hot 100. In Britain, the album finally hit number 1 on 27 July, for the first of seven consecutive weeks at the top. On the alternative UK listings compiled by Melody Maker, Band on the Run remained in the top ten from 26 January through to 23 November 1974. During that time, its chart performance similarly reflected the popularity of the two singles, with the album spending three weeks at number 2 in April, and six weeks at number 1 throughout August and the first week of September. The album topped the Billboard chart on three separate occasions during 1974, and was the top selling album of that year in Australia and Canada. In Britain, it came second in the year-end standings, behind the compilation The Singles 1969-1973 by the Carpenters. Through this success with Wings, McCartney established himself as the most commercially successful of the four former Beatles. Rodriguez views the album's arrival at number 1 on Billboard, in April 1974, as the moment when McCartney usurped George Harrison as the "ex-Beatle Most Likely to Succeed", so beginning a period of public acclaim that reached its zenith with the Wings Over America Tour in 1976. "Band on the Run" was eventually certified triple platinum by the Recording Industry Association of America; it would go on to sell 6 million copies worldwide and become EMI's top selling album of the 1970s in the UK. Its continued success through 1974 was also beneficial in allowing Wings to recruit a new guitarist and drummer, and to integrate them into the band before beginning new recordings. The album continues to be mainly regarded positively. Though in Erlwine's retrospective Allmusic review he feels that while some songs are excellent and the album overall is enjoyable, it is more showmanship than content. The Rolling Stone reviewer of the 30th Anniversary Deluxe Edition feels that "the real action still lies in the original LP's revved-up pleasures". Writing for Mojo magazine in 2011, John Harris included Band on the Run among "the trilogy of truly essential post-Beatles solo albums", along with Harrison's "All Things Must Pass" and Lennon's Plastic Ono Band. In 2000 Q magazine placed it at number 75 in its list of the "100 Greatest British Albums Ever". In 2012, "Band on the Run" was voted 418th on Rolling Stone's revised list of "The 500 Greatest Albums of All Time". All songs written by Paul and Linda McCartney, except "No Words" by Paul McCartney and Denny Laine. Album produced by Paul McCartney. Both record labels are clean and unmarked. The album cover is in excellent condition, displaying only minor signs of ring wear. The accompanying album poster is clean and excellently presented.